J.P. Crawford, who only turned 22 last month, is in his second major league camp with the Phillies in Clearwater this spring. 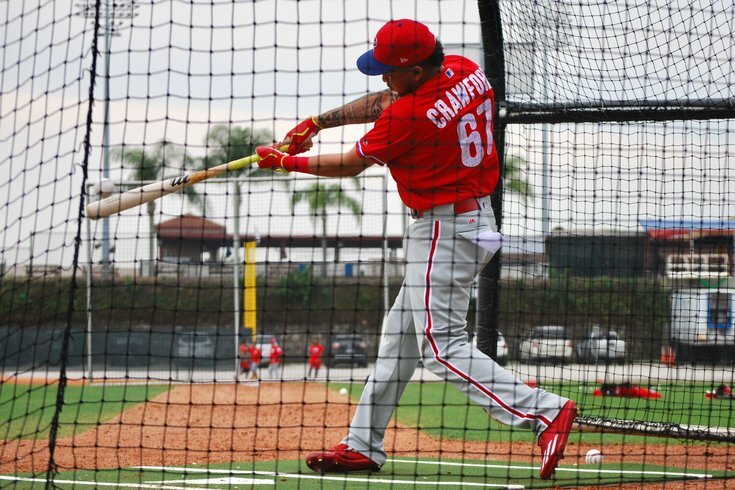 CLEARWATER, Fla. – For three straight winters, J.P. Crawford has been dubbed the top prospect in the Phillies farm system. For four straight summers, Crawford has made the jump to a new level, from the Gulf Coast League all the way up to Triple-A, often as one of the youngest players in his new league. Crawford only turned 22 last month, but he's on the brink of shedding his prospect status and breaking into the big leagues. It would be more than mildly shocking if that doesn't take place sometime this summer, even after a forgettable month of August last season (.189 in 20 games). Crawford's best offensive skill is the one the Phillies' lineup has largely lacked for the last half decade: plate discipline. His defense is sublime. 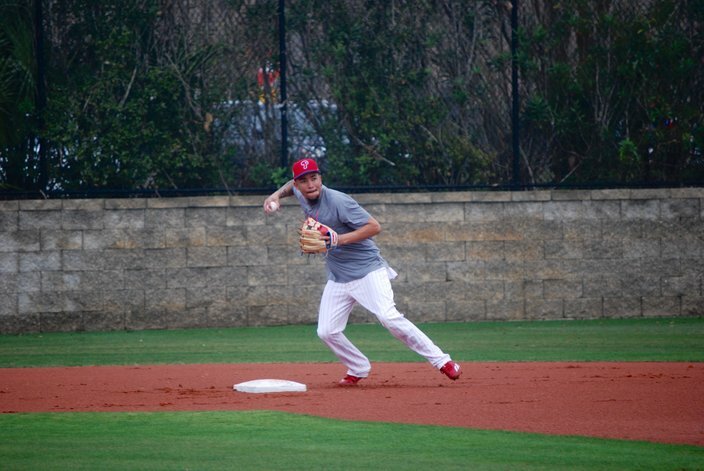 It's not an accident that the Southern California-bred shortstop took off for only a month last fall before taking regular ground-ball work in November and then kept at it until he reported to Clearwater, Fla., last week. "I really haven't seen enough of him so far this spring, but I know one thing: he's got a lot of potential, a lot of ability," manager Pete Mackanin said. "He's probably going to go to Triple-A and get his bat going and get his game going, and then we'll see where we go from there. I certainly believe he's going to play in the big leagues at some point." Crawford will probably see more time in Grapefruit League games this year than he did a year ago during his first trip to big league camp. Minor league camp can wait. But, before any of that happens, let's welcome Crawford to the latest edition of The Q&A. What was the greatest lesson you learned from last season? J.P. Crawford: Don’t put too much pressure on yourself. Toward the end of the season, I tried to do way too much offensively and that took a toll on me. So don’t think too much? Yeah, just play. Have fun playing again. That’s what I’m going to do this year. How does struggling make you better, how was going through last August make you better in the long run? You learn from it and you take it into next year. It was a great learning experience for me because I never struggled before. I’ll learn from it and hopefully, have a good year. How do you stay patient? When you’re at Triple-A you’re one phone call from being in the big leagues, so how do you keep that out of your head? Hanging around the clubhouse and hanging your teammates and living day by day without thinking about it. And just going out there every day and trying to get better. Any one area that you want to improve on? Just staying consistent on the field, offensively and defensively. Anyone’s style or approach that you try to copy or emulate? Nah, not really. I’ve had the same approach since high school. You stay within your plan. You look for a pitch somewhere, and if it’s not there you don’t swing. And you have to be comfortable hitting with two strikes, too. There are a lot. I’ve had a lot of good teammates here, all of them are great. I never had a bad teammate. Either Nicky Dubbs (Nick Williams) or (Jesmuel) Valentin. … They’re just naturally funny. Do you have a favorite ballpark? My favorite ballpark growing up was Dodger Stadium. You can’t go wrong with Dodger Stadium. Playing-wise, I’ll say Charlotte. Do you remember your first trip to Dodger Stadium? I think I was 7 or 8 maybe. What would you consider the thing you do best on a baseball field? I’d say making highlight plays, I think. Defensively. Any current shortstop’s defense you look up to? Current, actually I’d say Freddy (Galvis). I watch him all the time. He’s one of the greatest out there, he should have won a Gold Glove (last year). I watch him and he helps me, he’s a great teammate, too. Is that a weird dynamic, when there’s only a spot for one of you guys on the Phillies (in the near future)? Does that make it awkward? Not at all. We’re there for one another. I mean, we always try to help each other out, no matter what it is. I appreciate that. (Derek) Jeter for sure. And Ozzie Smith. Are you old enough to remember Ozzie Smith? Oh yeah, I’ve watched YouTube videos. ... we don’t win. We don’t win it all. That’s a big goal, man. It is. We can do it. I guess there have been teams that came out of nowhere before. Are you eyeing that one? Chris Coghlan’s got it right now. Did you have No.3 in high school? How about something you’ve seen recently? Either 'London is Falling' or the new Independence Day. TV show you’ve got into recently? I’ve been into a lot. I’ll say my two all-time are Game of Thrones and Stranger Things. When did you get into Game of Thrones, I think I asked you before and you hadn’t seen it? Last year. I got hooked on it. I saw an episode in the clubhouse, someone else was watching it, and I started watching and boom, crushed it. Alright, I thought you’d go with one of the Starks because of your own wolfpack at home. [Laughs.] Nah, Khaleesi is the baddest on there. What walk-up song would you choose if you got to the big leagues? Ooh, that’s a toughie. I mean, I’m still aiming at getting one for this year. Probably “Last Time” by Gucci Mane or “Swang” by Rae Sremmurd. What do you miss most about Southern California? My friends, honestly, my friends back home. Does your girlfriend come out here for Spring Training? Yeah, she’s out here living with me. OK, cool, I didn’t want to get you in trouble with that answer. It’s been four years since the draft. How do you think you’ve grown as a person since then? I’ve matured a lot. I learned a lot of stuff in the clubhouse, what to do and what not to do. just to hold your own in the clubhouse, don’t be too obnoxious, don’t step too far to where your standard is. Any one person you’ve learned the most from in the Phillies organization? Emmanuel Burris, last year, big time. I learned a lot from him in one (season). What in particular did you learn from him? Just to keep your business close to you, don’t tell too many people about your private life or your outside life.